Cats eating and drinking sitting down? We have about 25 cats. 99% sit down to eat or drink. I don't think most dogs do this. Why do they sit? Also after some lap time, they want to eat again. My thoughts: Wow, 25 kitties is quite the family! I thought I'd throw my two cents in on this one. Why do cats sit down to eat or drink? Cats tend to eat in a crouched position rather than standing on all fours. I suspect that's because that's how they're most comfortable. Since cats can quickly readjust and leap from that position, it probably doesn't put them at a disadvantage. I say if it's comfy, more power to them. Why do cats want to eat again after some lap time? While each cat has its own eating habits, eating multiple times with a break in between doesn't sound unusual to me. In my experience, cats often prefer to eat a meal in several sittings, rather than all at once. In fact, Jazzy often makes three or four separate trips in order to finish eating his wet food. Unless they haven't eaten in some time, cats don't usually gorge the way many dogs will. Many times if cats eat too much too fast, they tend to throw up (sometimes called scarf-and-barf), so I'd rather have Jazzy go at it slowly and make multiple visits. many cases, those cats came from situations where food was not readily available. In some cases, those cats will throw up and need to be fed smaller portions, multiple times in order to keep that from happening. Some readers have reported that elevating the food bowl helps with cats that are scarf-and-barfers. My guess is an elevated food bowl puts less strain on the neck, and seems to allow for easier swallowing (and perhaps less swallowed air). Cats with mobility problems, such as elderly cats, can probably benefit greatly from a raised bowl. You can make your own raised feeder stands, or purchase them online. Here are some cool looking acrylic ones from PetFusion. Make sure to get the short one for cats, not the tall one. I haven't tried these out myself yet, but they look cool, the bowls are stainless steel, and as I said, they're from PetFusion (Jazzy has enjoyed his PetFusion Ultimate Cat Scratcher Lounge). They also include a shallow, 1 inch bowl to help combat whisker fatigue. Since they're separate, they allow you to keep the food and water separated, which may help to encourage your feline friend to drink more water. A lot of raised feeder stands don't let you separate them, forcing the food and water to sit side-by-side. 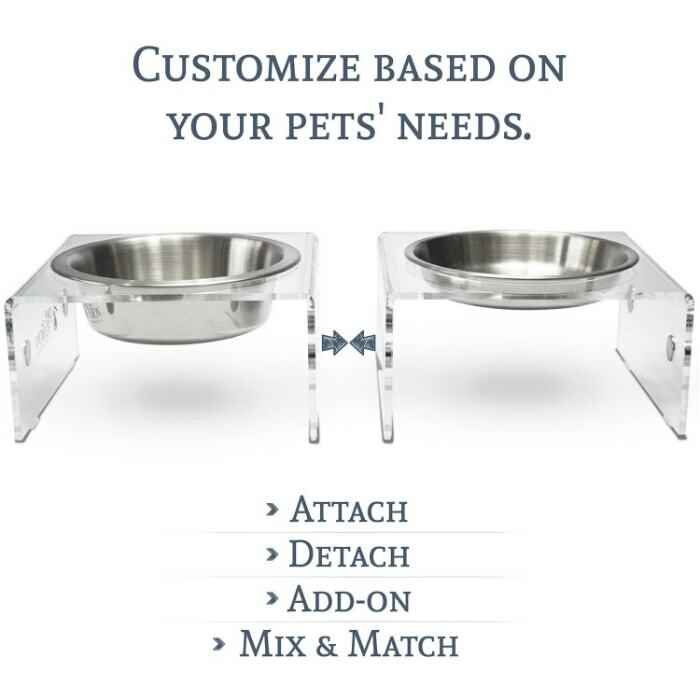 Click here to check out the PetFusion Innovative SinglePod Magnetic Pet Feeder (or click the picture below).